Les Producteurs de lait du Québec deplores the fact that Canada has signed the definitive USMCA text with the United States and Mexico without making amendments to the U.S. text, which includes provisions concerning oversight of Canadian dairy policies to which the Canadian government had said it would never consent. Bruno Letendre, Chair of Les Producteurs de lait du Québec, believes that the government has once again failed to keep its word, and milk producers will be impacted even more as a result. In his view, Canada relinquished some of its sovereignty over Canadian dairy policy to the U.S. when it agreed to abolish Class 7, the class of dairy ingredients that allowed producers to offer processors an additional competitive alternative for their dairy ingredient supply. “By giving in to this unwarranted demand by the U.S., Canada waives a right negotiated in the WTO agreements. It is clear that the U.S. wants to handcuff us and it is unacceptable that Canada has given in to it,” stated Bruno Letendre, Chair of Les Producteurs de lait du Québec. “In addition, by agreeing to place a ceiling on exports of Canadian milk solids non-fat and apply a surcharge on exports beyond a certain threshold, and especially, by agreeing to submit to a U.S. review of all changes to the classification and prices of milk sold by producers to processors, Canada is agreeing to U.S. interference, which not only potentially violates Canadian and provincial laws, but also international trade rules,” added Mr. Letendre. Canada has now signed three trade agreements that have hurt Canadian milk producers: the Comprehensive Economic and Trade Agreement (CETA) with the European Union in October 2013, the Comprehensive and Progressive Agreement for Trans-Pacific Partnership (CPTPP) in January 2018 and the USMCA just recently. In total, Canada has conceded the equivalent of 8.4% of Canadian dairy production and processing. Strictly in terms of market access, the concessions made for these three agreements represent lost milk sales in the amount of $450 million per year, i.e. approximately $41,000 per farm. In addition to these losses, there may be still others, ranging from $50 to $350 million, caused by the export surcharge that affects the volume of skim milk powder we can export. 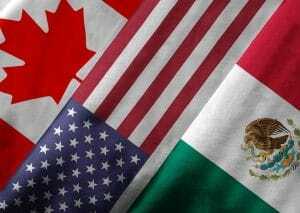 “During the press conference on October 1 announcing the conclusion of the USMCA, Minister Chrystia Freeland clearly promised to provide milk producers with full and fair compensation. Now that the agreement is signed and will be submitted to parliament for final ratification, we demand that Trudeau’s government keep its promise by setting up a compensation program in consultation with producer representatives that is accessible to all,” added Mr. Letendre. This promise was repeated in a Bloc Québécois motion that was unanimously adopted in the House of Commons. The motion demands that “the House call on the government to implement a program that provides financial compensation to egg, poultry and dairy farmers for all the losses they sustain due to the breaches to the supply management system in CETA, the CPTPP and the USMCA, and that it do so before asking parliamentarians to vote on the USMCA.” It should be noted that the Canadian government has still not compensated producers for the losses under CETA, which has been in effect since September 2017, and the CPTPP, which will come into force on December 30.